An inspiring 3 days at the Smart City Expo World Congress! It has been an exciting and inspiring 3 days at the Smart City Expo World Congress! Josep Perelló, managing director of Ateknea Solutions, had the opportunity to present our innovative air quality monitoring solution Bettair, as one of the winners of Call for Solutions. We received interest from many cities and integrators looking to incorporate the benefits Bettair provides, to help them improve the lives of their citizens by effectively applying actions to mitigate air pollution with highly accurate real-time data. 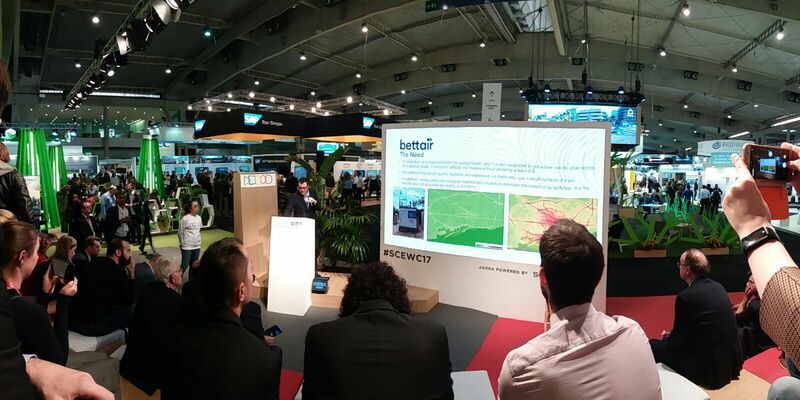 Ateknea and Bettair were featured at 3 different stands throughout the congress thanks to FIWARE, the Generalitat de Catalunya and SCEWC Call for Solutions. We were able to demonstrate the Bettair platform to many cities, representatives and citizens, sharing ideas and making connections with potential clients and partners from around the globe. 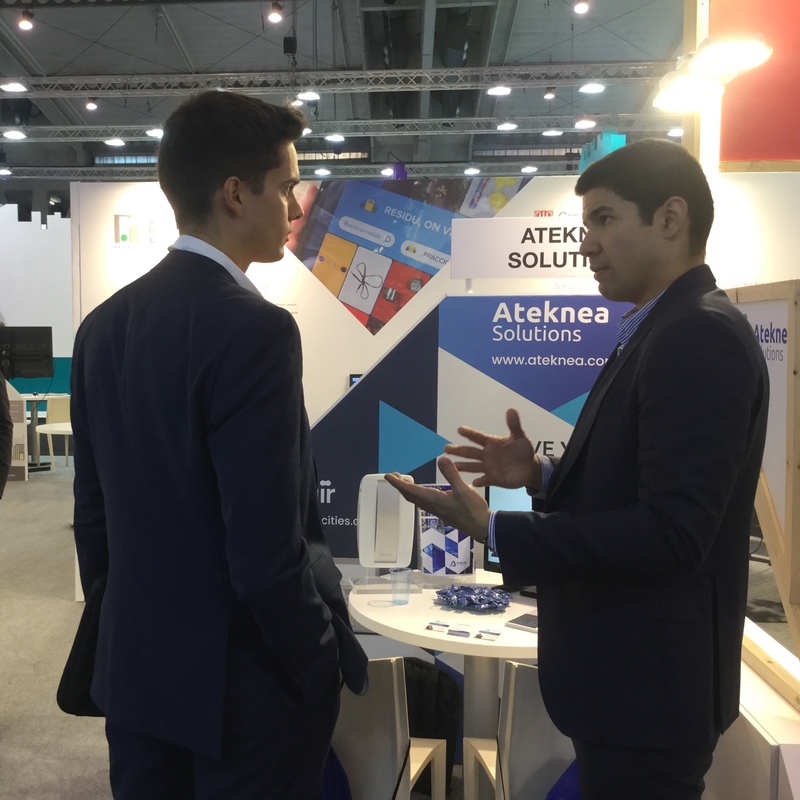 Ateknea also showcased the technological and business consultancy services we offer to European companies interested in taking their innovations to the next level. For more information about the other services Ateknea Solutions has to offer and Bettair please visit ateknea.com and bettaircities.com. You can also find us at the FIWARE summit later this month in Malaga. https://ateknea.com/wp-content/uploads/2017/11/Collage.jpg 391 1030 Ateknea Solutions https://ateknea.com/wp-content/uploads/2017/11/Logotipe-Ateknea-CMYK_border.png Ateknea Solutions2017-11-16 16:19:222017-11-16 16:19:22An inspiring 3 days at the Smart City Expo World Congress! The Smart City Expo World Congress Starts Tomorrow! Join us tomorrow at the Smart City Expo World Congress where we will be presenting Bettair alongside 680 international exhibitors and more than 700 government representatives from cities, regions and countries from around the world. As one of the 2017 Call for Solutions’ winners we’ll be kicking off this three day event with a short 10 minute presentation by our Managing Director Josep Perelló. He will presenting Bettair at the Agora stand in the Smart City Plaza along with the other winners of this year’s Call for Solutions from 15:15 – 16:15. Ateknea and Bettair will also be at the Generalitat de Catalunya’s stand in pavilion 2 stand D-401, the FIWARE stand in pavilion 2 stand B-231 and in The Village at the SCEWC Call for Solutions stand. Come by the Fira de Barcelona Gran Via from 9:00 to 19:00 Tuesday 14th to Thursday 16th and join us and over 420 top-level thought leaders and industry practitioners from key verticals in discussing the challenges and opportunities we face and how we can contribute to creating the Smart Cities of the future. https://ateknea.com/wp-content/uploads/2017/11/SmartCity_Redes_13-11-1.jpg 1189 3133 Ateknea Solutions https://ateknea.com/wp-content/uploads/2017/11/Logotipe-Ateknea-CMYK_border.png Ateknea Solutions2017-11-13 12:08:312017-11-13 12:09:26The Smart City Expo World Congress Starts Tomorrow! Ateknea Solutions had the honour of being one of the eight shortlisted Fi-Tech applicants chosen by frontierCities2 to participate in the contracting phase of their accelerator programme. The Call for Solutions looks for cutting-edge smart city solutions to showcase at Smart City Expo World Congress Call. 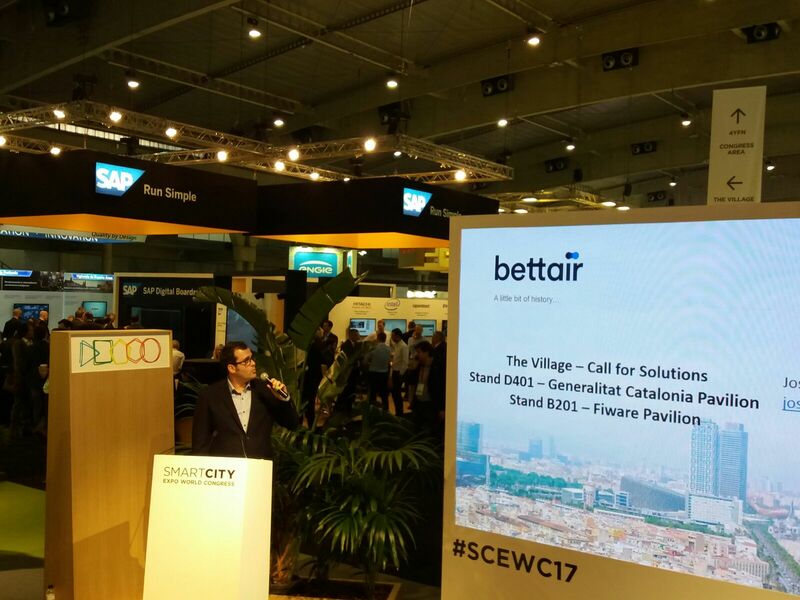 Thanks to our innovative and disruptive technology, Bettair, Ateknea Solutions was selected to be part of the Call for Solutions stand at this year’s SCEWC here in Barcelona. Bettair is a novel smart city technology that provides a highly efficient and large-scale pollution mapping tool that is low-cost, scalable, flexible and adaptable to any city. It provides them with the insights and information they need to better understand and mitigate pollution. This disruptive technology is based on accurate low-cost gas sensors that use advanced data post-processing techniques, to provide pollution measuring with an accuracy that is very close to that of traditional and more expensive equipment but for a fraction of the price. In fact, Bettair’s Pearson Correlation is higher than 0.8 compared to traditional AQM equipment. The high accuracy of our solution compared to traditional solutions allows cities to deploy them on a mass scale, creating a dense sensor grid that is able to monitor the entire city at a reasonable price. Bettair also offers cities custom visualization tools to visualize the information gathered from the sensors in a user-friendly and intelligent way. The Air Quality Index (AQI) is calculated using the pollution data collected and presented with the latest GIS visualization tools, all of which is adaptable to the requirements of each city. The information gathered allows cities to create appropriate urban plans for improving air quality and helps them to make better, smarter decisions to mitigate air pollution going forward. The technology has been tested in 11 different countries including Spain, Germany, Belgium, Ireland, Norway, Austria, Serbia, Israel, Slovenia, Czech Republic, and the US. Come see Bettair in action at the Smart City Expo World Congress, Nov. 14th, 15th and 16th at the Fira de Barcelona Gran Via. You can find us in The Village along with Call for Solutions as well at Pavilion 2 stand D-401 and stand B-231.